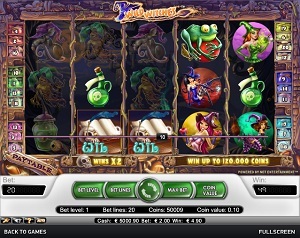 Wild Witches is an online video slot machine game from Net Entertainment that was released in February 2010. This video slot game has 5 reels and 20 pay lines. The theme of Wild Witches is, as its name implies, based upon the magical world of witches, potions and spells. Who said that all witches are ugly? Not in this online video slot game of Wild Witches! The theme of Wild Witches mostly centers on the different things that witches typically do, such as concoct potions on their cauldron, read and cast spells with the help of the Book of Spells, ride a magical broom, and put enchantments with the use of their trusty magic wands. What most online slots players love about Net Entertainment is that they let everyone to play instantly on their slots games without them having to download any software at all! This online slots game features wild substitutions, scatter wins, a Free Spin Bonus Feature game wherein all winnings are tripled, a Witchy Wild multiplier symbol, a maximum cash jackpot of $40,000, and a minimum coin jackpot of 40,000! Designed for those who are into magic and believe that witches and potions do exist, Wild Witches is definitely the slots game to play at! Get ready to ride a magic broom, concoct potions, learn new spells, have fun playing, and experience the magical world of Wild Witches! What online slot players can expect from Net Entertainment’s Wild Witches is that it is packed with stunning animation graphics and realistic sound effects, and a nice bonus feature to make sure that all those who play will totally be entertained with this online video slots game. The setting of this slot game is on a mountainous area at nighttime, where one will find an old house perched on the topmost part of the mountain. The overall graphic design of Wild Witches displays a wide array of vibrant dark colors, and since the setting is on top of a mountain at night, it is not surprising that the main color of this game is dark blue-black. Other colors used in the Wild Witches online slot game include green, blue, yellow, purple, red, black, purple, brown and pink. Wild Witches has sound effects that will surely make you imagine that you are in a spooky mountainous area wherein you will end up at an old house that is full of witchcraft-related items. The eerie sound of the wind and the hoot of an owl perfectly complements the theme of Wild Witches. When you spin the reels and hit a winning combination, lively and celebratory music will fill your ears. In the Wild Witches online slot game, there are no card deck symbols being used. Instead, the regular symbols they have used in the Wild Witches slot game complement the witchy theme perfectly, such as witch characters named Witch Louhi (pink outfit with apples on hands), Witch Medea (black outfit with a spellbook), Witch Fuamnach (green outfit with a potion), Witch Dalal (blue outfit with a wand), Witch Fatin (orange red outfit with a pumpkin), and Witch Maeve (purple outfit, riding a broom). Other symbols used in the game are the Frog, Mandrake Root, Rat, Poison, and a Jar of Eyeballs. In the Wild Witches slot game, there are the Wild Symbols – the Witches Spell Book and the Witchy Wild symbol. Wild symbols mean that they substitute for other symbols to complete winning combinations, and in this slot game, they can also multiply your payout! • The Witches Spell Book symbol is a Wild, Multiplier symbol that appears anywhere on the 5 reels. Not only can it substitute for other symbols to complete winning combinations, but it also doubles (multiplier x2) your payout! If you get multiple Witches Spell Book wild symbols on an active pay line, you will be awarded prizes (shown in the Paytable). • The Witchy Wild symbol is also a Wild, Multiplier symbol, but it only appears on the 3rd reel. Not only can it substitute for other symbols to complete winning combinations, but it also quadruples (multiplier x4) your payout! The Scatter Symbol is the Cauldron. The Cauldron Scatter symbol is not required to come out in a line on an active pay line in order for you to win. The Scatter symbol can be found scattered anywhere on the 5 reels, as long as there are 2 or more Cauldron Scatter symbols that come out in a single spin. If you manage to hit 3 or more Scatter Symbols that are anywhere on the 5 reels, the Free Spin Bonus Feature game will be activated which can reward you with 10, 20 or even 30 Free Spins! During the Free Spin bonus game, all completed winning combinations are tripled (multiplier x3)! Please keep in mind that if you get a scatter win and a regular win, you will be paid out for both of these wins, because the Cauldron scatter symbol is not required to come out on an enabled pay line to win. Scatter rewards are entirely independent from pay line rewards and they are therefore included to the pay line win. Wild Witches Free Spin Bonus Feature Game – It is triggered when you hit 3 or more Scatter Symbols (Cauldron) that are scattered anywhere on the 5 reels. If you hit 3 Scatter Symbols (Cauldron), you will be rewarded 10 Free Spins; if you hit 4, you will be rewarded 20 Free Spins; and if you hit 5, you will be rewarded 30 Free Spins! All of the winning combinations that you hit during the Free Spin games are tripled! Another great thing about their Free Spin Bonus Feature game is that if you manage to hit another 3 or more Scatter Symbols (Cauldron) while playing the Free Spin game, you are rewarded another set of 10, 20, or 30 Free Spins! The extra Free Spins you get are then added to the remaining number of Free Spins. During the Free Spin Bonus Feature game, you can be awarded an infinite number of additional free spins! When the Free Spin Bonus game is over, you are then taken back to the regular Wild Witches slot game, and all of your Free Spin game wins are added to your total win. Wild Witches online video slot game has 5 reels where you may bet on 20 pay lines. The minimum bet is 0.01 and the maximum bet is 1.00 per line. You can wager from 1 up to 4 coins per bet line. It is absolutely more fun and easy when there is an Autoplay function available in online slot games. In Wild Witches, you can access their Autoplay function by clicking on the Autoplay button on the lower left corner of the screen. You can choose how many spins that the Autoplay with spin automatically for you – it can be from as low as 10 up to as high as 1000! You can even customize their Autoplay by clicking on the Autoplay button and going to the Advanced Settings menu. You can choose to Stop Autoplay when you manage to win on a spin, if free spins are won,, if a single win exceeds a certain amount, or if the their cash increases or decreases by a certain amount. When you are satisfied with the Autoplay settings, you only have to click Start and the Autoplay will spin automatically for you. « More slotmachines guides Article last updated: Thursday, February 28, 2013.